The country will mark the 27th anniversary of the EDSA People Power Revolution of 1986 this coming February 25. The day, which this year falls on a Monday, is a special holiday for all schools nationwide. The holiday gives students their first three-day weekend this year. Parenthetically, this is not a special non-working holiday for employees unless you’re working in an education institution (like me. LOL). This is in accordance to President Benigno Aquino III’s Proclamation 459, which he signed last year. Click here to read the full text of Proclamation 459. The proclamation claims that People Power I “restored and ushered political, social, and economic reforms in the country.” It further adds that the said historical event “serves as an inspiration to Filipinos everywhere as a nation and as a people.” Of course, Aquino’s mother, the late former President Corazon Aquino, is the one most Filipinos associate with EDSA 1986, rightly or wrongly. According to a press release by the Department of Labor and Employment early this month, since February 25 is an ordinary day for private offices, employ to their regular rate. 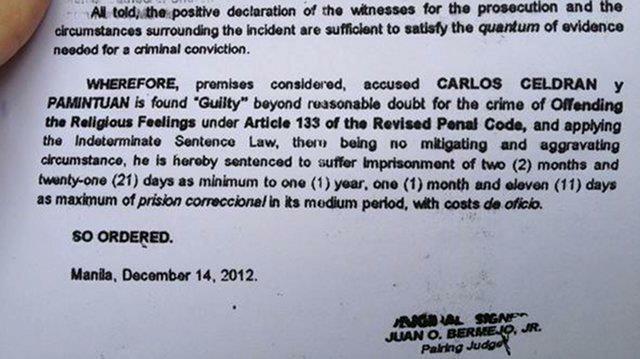 Celdran is facing imprisonment of up to a year after Pairing Judge Juan O. Bermejo Jr. of the Manila Metropolitan Trial Court ruled that he committed a crime when he disturbed a mass at the Manila Cathedral last September 2010 by raising a “Damaso” placard while dressed up like Jose Rizal. HRW’s Asia Researcher Carlos Conde hit the court ruling as a “setback for free speech in the Philippines.” He added: “This verdict should be reversed. Nobody should be jailed for voicing out an opinion or position, especially on a subject that concerns the lives of millions of Filipino women and mothers.” Conde likewise called for reforms to the “archaic” RPC, saying that some of its provisions can be misused and utilized for malicious prosecution. Bulacan will mark the 87th birth anniversary of its favorite son, the late Senator Blas F. Ople, this February 3. The day, which this year falls on a Sunday, is one of the legal holidays in Bulacan as listed in its Provincial Administrative Code. This special non-working holiday comes merely 11 days after Bulacan marked the 114th anniversary of the inauguration of the First Philippine Republic last January 23. Ople was the country’s foreign affairs secretary at the time of his death in December 14, 2003. He served as labor minister during the administration of Ferdinand Marcos and as Senate President from 1999 to 2000. Another Angara enlisted the support of pop superstar Sarah Geronimo for a senatorial bid. The camp of Aurora Rep. Juan Edgardo “Sonny” Angara, who is running under the Liberal Party banner, has recently released a radio and television advertisement featuring Geronimo. “Sa iyo ang tiwala ko. Sa iyo, hangang-hanga ako,” Geronimo sang in the ad. “Tiwala ako kay Angara. Angara ng Pinoy!” Geronimo concludes. As of writing time, the Angara camp is yet to upload the video on YouTube. Currently the chair of the House of Representatives (HOR)’ Committee on Higher and Technical Education, Angara is using education as a key campaign talking point just like his father. According to his page in the HOR website, the two-term solon from Aurora has authored a bill that seeks to expand the education voucher program for the secondary and tertiary levels and another one that proposes the integration of preschool education into the basic education system. COMMENTARY: Being endorsed by a popular singer certainly won’t harm a politician who’s running a national campaign for the first time. For certain, many Filipinos still remember Geronimo’s campaign ad for the elder Angara even if it’s been six years since it was last aired (though it remains to be in YouTube). Judged from the context of building name recall, reusing the tagline “Angara ng buhay” is an excellent move (just like the case with “sa UNA, gaganda ang buhay”). However, the younger Angara should make sure that his succeeding ads highlight his personal vision and accomplishments. He cannot stay on his father’s shadow forever. February 10 2013 Chinese New Year Philippine holiday? 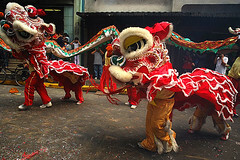 Is Chinese New Year 2013 a holiday in the Philippines? Unlike in 2012, Chinese New Year (also referred to as Spring Festival) is not included as a special non-working holiday by President Benigno Aquino III in his Proclamation 459, which lists all legal holidays for 2013. Deputy Palace spokesperson Abigail Valte explained that there is no need to do that anymore since Chinese New Year 2013 falls on February 10, which is Sunday. This logic is faulty since many companies especially those in the business process outsourcing industry require employees to work even during Sundays. A holiday declaration for February 10 would have entitled everyone who’ll render overtime service on that day an additional of 30% to their regular hourly pay. In declaring Chinese New Year 2012 a special non-working holiday, Aquino noted that the said event is “one of the most revered and festive events” celebrated not only in China but also in the Philippines “by both Chinese Filipinos and ordinary Filipinos.” Malacanang reiterated that this was done to “manifest the Filipinos’ solidarity with the Chinese-Filipino community.” Aquino is of Chinese descent. PS: In connection with the celebration of the Chinese New Year, February 12, 2013 (Tuesday) has been declared as a public holiday in Singapore by the Ministry of Education. The interview started with Lo awkwardly asking Hathaway how she “lost her weight and got it back.” The actress snapped: “I’d rather not talk about the weight loss, please.” Lo later on mentioned about “a friend from the Philippines named Lea Salonga,” which elicited a positive response from Hathaway. “I adore her,” she said. Hathaway went on to say that Salonga has “one of the great voices of our time” and that “there’s nothing vocally that she can’t do” and that she has “complete deference to her.” “If you think of me as an actor who sings rather than as a singer, I’ll probably be more impressive,” Hathaway said, evidently highlighting the differences between her and Salonga. After asking about how her mom appreciates her work, Lo asked Hathaway how she is able to portray the character of the impoverished Fantene given that she is “living a life of luxury.” “That’s a very personal question,” Hathaway shot back. Lo then proceeded to ask the Academy Award-nominated actress about the scene in Les Miserables she found most challenging (it’s singing “I Dreamed a Dream”). 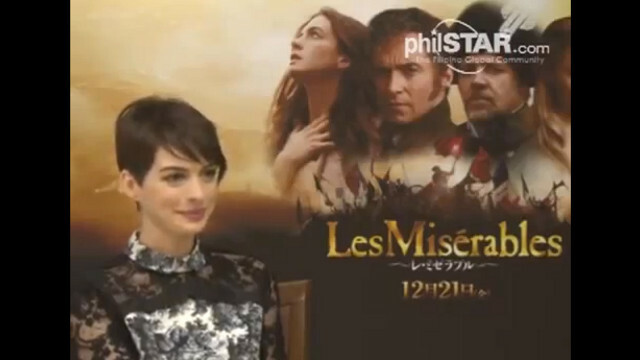 When Lo asked her for any message to Salonga, an apparently pissed Hathaway said “We’ve already talked about that.” And to end the interview, Lo asked Hathaway to invite Filipinos to watch the movie but the actress did not oblige. “Why don’t you invite them? I think they’d much rather hear from you,” Hathaway said. Noticeably, Hathaway did not even look at Lo when she said that. She also did not shake his hand when he ended the interview. It’s easy to see how this exchange went disastrous. And please, the issue here is not the number of Hollywood celebrities that Lo was able to interview throughout his career. Opening your interview with a question about one’s weight is certainly a no-no.the way it is rude to tell a person how fat he/she has become (“tumataba ka yata!”) after not seeing each other for a long time. But if Hathaway really does not want to talk about her weight loss, why did she do so in her interview with Vogue? Lo’s question about how Hathaway was able to portray the role of a poor woman despite “living a life of luxury” is inane aside from being poorly worded. Isn’t it that Dolphy, Fernando Poe Jr, and Joseph Estrada were also able to play the role of poor folks even though they’re obviously not living in poverty themselves? Anne Hathaway and everyone else in her industry are not called actors and actresses for nothing. What clearly pissed Hathaway the most is Lo’s repeated reference to Salonga. By stressing that she’ll be more impressive if she’s judged as an “actor who sings and not as a singer,” Hathaway is indirectly saying that they should not be compared. But Lo obviously didn’t get the cue and instead mentioned her again toward the end. For someone who came to know Hathaway through Princess Diaries, her behavior when Lo is wrapping up the interview is just plain mean and disrespectful. She may be disgusted with his line of questioning, but heck, that’s her opportunity to address us Filipinos! *Hathaway was interviewed by Filipino writer Manny the Movie Guy last December (watch the video below). If watching Lo’s interview with the Les Mis actress made you feel bad, this one’s SO MUCH different. After all, the interviewer actually asked her about the movie, and not about Salonga. It’s evident that Hathaway had fun with the interview. Is Cynthia Villar repeating Manny’s advertising blunders? Former Las Pinas Rep. Cynthia Villar aired her first infomercial for Villar Foundation (VF) summer of 2012. Mrs. Villar is running for Senate because her husband Manny is constitutionally barred from seeking a third consecutive term. Luckily for her, their foundation marked its 20th anniversary just a year before the 2013 midterm elections. This gave her an excuse to constantly appear on television throughout 2012 in the guise of promoting their advocacies. From campaigning to protect the Manila Bay, to promoting livelihood workshops, and sponsoring events for bloggers, Mrs. Villar is virtually omnipresent. And her efforts seem to be paying off. According to a December 2012 survey by pollster Pulse Asia, she will most likely win a Senate seat. Mrs. Villar has aired two television ads so far. Directed by veteran filmmaker Mark Meily (of Crying Ladies fame), the 30-second ad features the life story of Divine Resus, a 20-year-old poor lady who benefited from VF’s coconut weaving workshops. Midway through the ad, Villar appears. “Hanep na ang buhay, kapag may hanapbuhay,” she and her women supporters concluded. The reaction online to Mrs. Villar’s first ad has been largely negative, mainly because it is considered as premature campaigning. The acting and the physical appearance of the video’s protagonist also received ridicule. She also seems to have repeated her husband’s mistake of being perceived as setting herself apart from other people in the ad, albeit unintentionally. How did this happen? First, understand that the public generally reacts negatively to candidates who engage in premature campaigning (see for instance how people embraced the anti-epal online movement). Then, the latter part of the video is more appalling. Mrs. Villar evidently wants to establish her connection to the masses through the ad. One major mistake is the ad’s attempt to make Mrs. Villar stand out from the rest by focusing the lighting on her while deliberately making everyone else in the shot look dull. See the snapshot below for reference. This is like the controversial cover of FHM magazine last year where Bela Padilla’s whiteness was emphasized by making everyone else around her look extremely dark. This leaves a bad taste in the mouth. The funny thing is, her husband Manny also committed the same blunder in one of his pre-campaign period ads in 2009. At the 0:27 mark of this commercial, Villar can be seen wiping off his hand after holding several mud-covered ducks in a farm. Of course, any person would certainly do that, but do they have to show that in the ad? PS: The second one, which goes to the tune of Gloc 9’s “Simpleng Tao” shows other women beneficiaries of VF projects. “May hanapbuhay ako, mula sa iyo,” the unidentified female singer chants. As of writing time, this video has not been uploaded in YouTube.